Eco MFP Studio 306LP can "erase" specially designed toner to enable reuse of paper. Techradar reports that the printer from Toshiba is able to "scrub clean" pages that have been printed using Pilot’s FriXion ink already used in the stationery company’s erasable pens, changing the blue toner into white so that paper looks almost new. Noting that "80% of everything printed is discarded within half an hour", Toshiba applied the FriXion blue ink to a laser printer so that users can save money whilst also helping the environment by reusing resources. Able to print on both sides of a page on any printer paper, the printer comes with a separate RD30 erasing unit which uses heat and pressure to erase the toner on a printed page, turning it white so that what was printed becomes almost invisible, although the article states that "if you squint, you can see the shapes of some of the letters under a bright light". Toshiba says that paper can be reused "five or six times", with one employee claiming that he was able to reuse some pages up to fifteen times. In addition, pages are scanned by the printer before they are erased so that users are able to recover a copy from the hard drive should they find that they need it again; and scans the page again once text has been erased to check for any marks that have been missed, with pages that are deemed too messy being diverted to a different paper bin to prevent it from being used again by mistake. While Toshiba has only used the technology on large business printers, it hopes that if the idea takes off it could become "an option for home printing as a separate toner cartridge". Changing Your Team’s Thinking On Being Green? Priceless! Priceless Ink & Toner Company in Port Charlotte, FL is a major exporter and wholesaler of high-quality discounted printer accessories, ink and laser toner supplies in the USA and Europe. Priceless believes that price should not be a compromise for quality and offers a fine selection of maximum yield OEM and compatible inkjet, laser and ribbon products to their customers. A member of the Green Business Bureau since May of 2011, Priceless Ink has reached the Platinum tier of Green Business Certification. Owner, Ray Slipatchuk, contacted us with a success story that he and his team experienced after joining the GBB and going green. What was the initial staff reaction to greening your business? I held an office meeting to announce that Priceless Ink was going green. You cannot imagine the facial expressions in the room. It was like a shock wave radiating through the organization. I probably would have gotten a better response if I fired everyone. However, the shock wore off within a day and most associates started to think about how our team could change to make a positive difference by making the right choices (of course it didn't hurt that I offered a $50 Olive Garden diner card for the best ideas). I was truly surprised by the way everyone embraced the green initiatives recommended for us in the GBB program, especially once they realized how it could positively impact our lives, families and community. What have been some of the biggest challenges to going green? There was one individual, Kim, who had a specific problem with being "all green". This young lady couldn't get over the idea that we were going to stop using Styrofoam cups. For years Priceless had provided coffee in Styrofoam cups. However, since being green is a total commitment, our team decided that the Styrofoam must go. 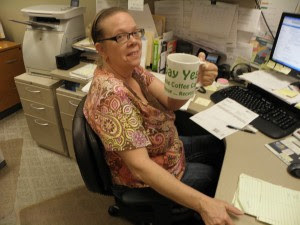 It was a difficult change for Kim and initially she even snuck in Styrofoam from home. I decided to order a special and personal coffee cup for her (notice how beautiful it is in the photo!) to use in the office and asked that she try it for two consecutive weeks. If after that time, she couldn't break the "Styro habit", I would make an exception for her. Well, you can guess the outcome. The beautiful personal coffee cup became a real hit with our entire staff; they'd compliment her coffee mug at every opportunity. Kim cherishes it, guards it and will not even allow someone else to wash it! What positive results have you seen from going green? From a financial point of view Priceless Ink has experienced substantial savings in business operational costs. Additionally, since our associates are proud of their accomplishments, they have gone into the community to help spread the word. This personal involvement has brought our company new business and opportunities in the local market. We believe in remanufactured products especially if they are Made in the USA because they do favorably impact the environment and save the consumer substantial money and that's always a good thing. Way to go, Priceless Ink & Toner Company! The Green Business Bureau is very proud of your progress and of the initiatives you are implementing to make your workplace greener. Thank you for your commitment to making a difference for our planet. Keep up the great work! Source: Changing Your Team’s Thinking On Being Green? Priceless! 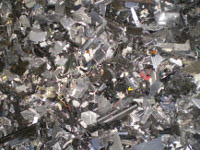 Empties collector speaks of cartridge shredding business success and plans for the future. After launching its cartridge shredding project last year, Germany-based Cartridge-Space has seen the business grow, with new facilities planned for the future as the project develops. The project involves aftermarket companies selling non-reusable inkjet cartridges to Cartridge-Space, which takes a different approach to thermal disposal; preparing and separating each component of a cartridge – plastics, metals and sponges – by optimizing the editing process in the shredding so that nothing is wasted. Defective, non-refillable, production committee and overlaid ink cartridges are all purchased by the company. Prices paid by Cartridge-Space for inkjet cartridges vary depending on whether the shipments are from Germany or elsewhere in Europe and the percentage of print heads included; with prices rising to $260 per ton for pallets of ink cartridges with print heads delivered to the company’s warehouse. Commenting on the project, Cartridge-Space’s Andreas Steiner, said: "We decided to start purchasing inkjet cartridges as a special part of the main shredding project because thermal utilization of non-reusable cartridges etc. is no solution for us. We are a waste disposal management company and work in a very environmentally friendly way. Through a new step in the separation process it’s possible for us to pay for defective inkjet cartridges." Following the project’s success so far, Steiner stated: "At the moment, we are planning a brand new facility next to our existing one, and with our new machine we are able to shred an extra 250 tons of cartridges per month." Two iPad Minis giving away! Funai Electric Company Ltd. announced that it has signed an agreement to acquire Lexmark International Inc.'s inkjet-related technology and assets for approximately $100 million. Upon closing of the transaction, Funai will acquire more than 1,500 inkjet patents, Lexmark's inkjet-related research and development assets and tools, all outstanding shares and the manufacturing facility of Lexmark International (Philippines), Inc., and other inkjet-related technologies and assets. Through this transaction, Funai will acquire the capabilities to develop, manufacture and sell inkjet hardware as well as inkjet supplies. The transaction is subject to customary closing conditions and is expected to close within the first half of 2013. As an OEM manufacturer, Funai has manufactured inkjet hardware for Lexmark since 1997 and the companies have established a strong relationship over that time. The acquisition of the inkjet-related technology and assets will enable Funai to launch new inkjet hardware and supplies under Funai's own brands. Funai has established a strategy to develop and grow its inkjet printer business by introducing Funai's own inkjet printers and supplies into the market. With the inkjet patents, state-of-the-art manufacturing facilities and comprehensive R&D capabilities, Funai will be able to accelerate the expansion of its inkjet business. For Lexmark customers and distributors, there will not be a disruption of service or support as they continue to work directly with Lexmark. Funai will become a manufacturer of Lexmark's aftermarket inkjet supplies. Lexmark will continue to support its installed base of customers in the sale of aftermarket inkjet supplies and will continue to provide customer technical and warranty support. "This transaction provides us with a crucial and tremendous opportunity to enhance our office solution business," said Funai president and chief executive officer, Tomonori Hayashi. "Funai and Lexmark have developed a great partnership, and we are glad to take over Lexmark's inkjet-related technology and assets. The acquisition of the inkjet-related technology and assets enables Funai to start and grow our own inkjet business. Funai will benefit from the strong inkjet business platform that Lexmark has established." "As we continue our transition to becoming a leading end-to-end solutions provider, this transaction essentially completes our exit from the ownership of inkjet-related assets, although we will continue to support our existing customer base with the sale of inkjet supplies," said Paul Rooke, Lexmark chairman and chief executive officer. "Funai has been a trusted partner of Lexmark's since 1997, and I am fully confident in Funai's ability to deliver high-quality inkjet supplies for Lexmark." A few days ago (March 26, 2013) Canon Inc. announced that its consolidated subsidiary Océ N.V. which was delisted from NYSE Euronext Amsterdam in February 2012, became a wholly owned Canon subsidiary on March 8, 2013, following the conclusion of formal statutory buyout proceedings under Dutch law ("squeeze out procedure"). Canon announced it would acquire Océ in 2009, but the Japanese company did not immediately acquire 100% of the company's shares. As of the end of 2011, Canon had a 98.83% stake in Océ. Under Dutch law, the Japanese firm had to begin a so-called squeeze-out procedure at the start of 2012 to acquire the remaining shares. Océ's integration into Canon has meant reducing the company’s workforce. DutchNews.nl reports that Océ has cut 300 workers from its staff of 2,400 at its headquarter in Venlo. Last fall, various Connecticut news outlets reported that Océ North America would cut 135 jobs in the state before December 31, 2013. Since joining forces, Canon and Océ have jointly developed new products and worked to strengthen their marketing and service capabilities. Now that Océ has become a wholly owned subsidiary, both companies will work to maximize synergies with the aim of creating the overall #1 presence in the printing industry.